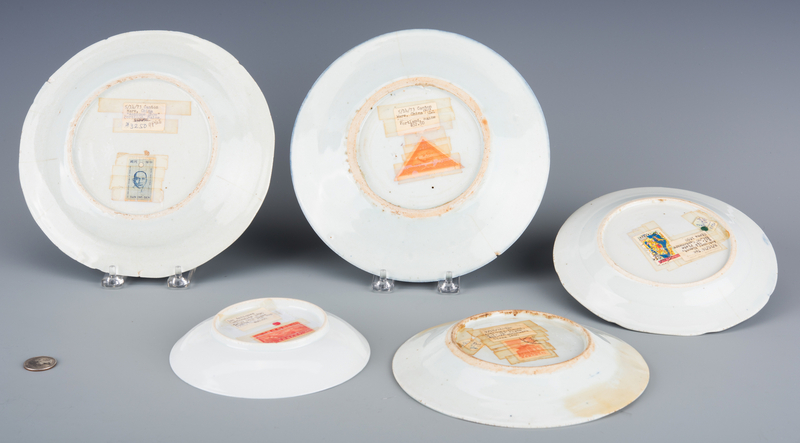 Group of Chinese Export Canton and Nanking blue and white porcelain items including four (4) plates, 1 octagonal form (ranging in size from 6″-9″ dia. ), 1 shaped round serving plate ( 10 1/4″ dia. ), 1 round saucer (6″ dia.) and 2 small octagonal serving platters (ranging in size from 10-12″ L). All late 19th/early 20th century. CONDITION: One smaller plate with brown staining to underside of rim indicating possible old repair, 2 larger plates with hairline cracks to rim and chips to edge, one small plate with hairline crack to rim, one platter with brown staining to underside of rim indicating possible old repair.